Welcome to Blog Profiles! Each week, PR Newswire media relations manager Christine Cube selects an industry or subject and a handful of sites that do a good job with promoting, contributing, and blogging about the space. While Christine is on maternity leave, Mary Johnson will be filling in. Do you have a blog that deserves recognition? Tell us why on PR Newswire for Bloggers. Teaching isn’t just a career; it’s a calling. Those incredible souls who answer this calling are tasked to take a room full of strangers’ kids and somehow teach them to be productive citizens. Teachers don’t just explain facts but also teach social skills, teamwork, responsibility and accountability. Although a teacher’s day is long, there are quite a few who are so dedicated to their profession that they go home and share their stories, lessons and passion on their blogs. Here are just a few that I’ve found in honor of Teacher Appreciation Week. What the Teacher Wants is written by Rachelle and Natalie, elementary school teachers sharing their lesson plans, worksheets, ideas and end of year teacher problems. Rachelle and Natalie are not just sharing their ideas, but also creating unique resources. They offer freebies like downloadable writing prompts and Eye Spy Time, which will be useful this summer as I keep my children sharp for the next school year. My favorite posts are the ones that give you a peek into their classrooms, such as Rachelle’s classroom reveal last August and Natalie’s rainbow filled computer lab. Teachers were not this creative back in my day! Follow What the Teacher Wants’ Natalie on Pinterest and Rachelle on Pinterest. Reflections of a High School Math Teacher not just shares stories of a high school math class, but also gives you a glimpse into Mr. Sladkey’s class and teaching style. One of his most surprising posts was his recap of shadowing a student for a day. Sladkey not only shared his day as a student but also his notes on what he could do to modify his teaching. In addition to this blog, Sladkey also runs the blog Energizing Brain Breaks, where he encourages teachers to give students a kinesthetic brain break every 25-30 minutes and shares examples like pen flipping and thumb war or peace. Follow Reflections of a High School Math Teacher on Twitter. Katie teaches second grade and her blog is a reliable resource for teachers with Teacher Freebies and Bright Ideas aimed at making teaching fun. I’m especially fond of how she ends her school day with an awards ceremony, which she explains in a video with darling printables for purchase. She is not all about the classroom, though. She also shares with poise and grace what it is like to be a NICU parent as well as her “Maybe Baby” story. 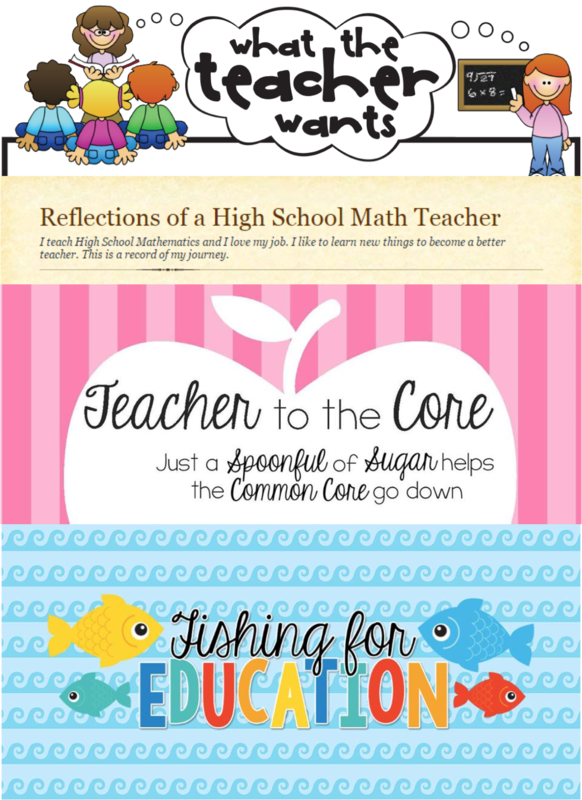 Follow Teacher to the Core on Pinterest. Katie writes Fishing for Education and has recently moved from the U.S. to be a relief teacher in Australia. Like most of her colleagues above, Katie uses Teachers Pay Teachers (TPT) to share and sell worksheets and other educational resources. This is a remarkable site that allows teachers to get paid for their creations. You can learn more about TPT by reading Katie’s ten tips for using it. Follow Fishing for Education on Pinterest. P.S. Ever wonder how we come up with ideas for our blog profiles? Our handy list of industries and subjects on PR Newswire for Journalists stays top of mind. If you’re a blogger or journalist looking for education or children-related news, let us know. We’re happy to customize any of those feeds for you on PR Newswire for Journalists.